Hello, all! It’s been a while since I wrote anything, but hey, I guess I didn’t have much to talk about. Anyway, recently I got a new computer, and you know what that means! Time to review a mobile game! If you’ve been keeping up with the news, you would have heard that recently Nintendo has had its sights set on entering into the mobile gaming world. Naturally, the first thing they decide to do is to create a social network for Nintendo fans. It’s a good choice, but on the other hand it’s also hilariously out of character: Between The Big Three, Nintendo’s social features have always been dead last, with a ridiculously slow interface and a constant need to pause and even suspend any software if you wanted to read a message sent out by your friend. Not to mention that their greatest 3DS feature, SwapNote, has been canned because of irresponsible parenting. Going by history, Nintendo is the last company that should ever make a social network application, but here we are. Now the question remains if they learned from their mistakes. Nintendo is a family oriented compay with such lighthearted classics like Mario and Splatoon under its belt providing for an upbeat atmosphere. It’s hardly the place to read dreary, depressing, and dark comments from the community, but there you go. I don’t know what it is about the upbeat atmosphere of the game that gets people to post hilariously depressing answers to perfectly average questions, but I can’t stop doing it, somebody help. One look at the Twitter feeds for every question you answer and you can bet somebody makes a very nihilistic or probably even borderline offensive post, and it’s hard not to want to get in on the fun. When I first got Miitomo, I tried to be a brooding individual with nothing but comically dark answers to benign questions regarding my tastes. The first few days I went by with flying colours, before suddenly, bit by bit, I started revealing things about my actual self. Not secrets, mind you, no matter how much the game tries to pry to get me to spill the beans (it will literally ask you to share “secrets,” which I can’t imagine anybody answered differently than “but then it wouldn’t be a secret”). But little things, like hobbies and interests. You know, normal stuff. Like cannibalism. Somehow I managed to naturally just put myself in the Mii as opposed to some weird, grimdark persona, and I don’t even know how it happened. The game asks totally basic questions, whose answers are then shared with your friends. Once they’re received, they can get in on the conversation by typing up their comments and you can join right back in. One question once generated a grand total of 35 comments which steered into fictional politics somehow. Another about whether or not a bear can use a lightsaber if he knew how to flip pancakes. It all makes sense in context, but the ride to get there was equally wild. But they are. Very much so. In fact, I was surprised to see that some of my conversations unfolded just like they did in this trailer including the part where I was wearing a hot dog suit and how it all just kept going. 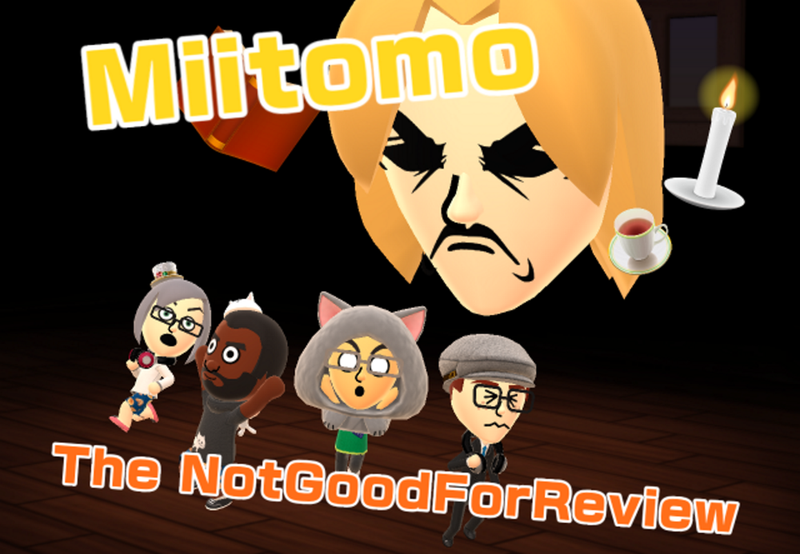 Pretty much the only problem is that if you want to use it to create a funny picure, you can’t share it through Miitomo like you can when your character changes clothes (in which case the game sends a pic to everyone of your Mii’s new outfit). Instead, it’s relegated to be used exclusively in comments, or in other social media. There’s no gallery for your friends to look at when they visit your Mii, either. So unless you know you have an audience, these pictures just sort of stick in the vault. Miitomo Drop is the primary feature for which the App is trying to make money via microtransactions. Essentially, it’s something of a “claw game,” although instead of a claw you drop yours or your fiend’s Miis through hellish deat traps in order to have them break their bones on the obstacles so you can unlock exclusive clothing not seen in the shop. The idea is pretty sound, and you can get some cool stuff like ninja gear and all, but between the game basically being entirely luck based, those who do win end up joining the pantheon of Miis who all suddenly look identical, wearing the same Miitomo Drop outfit. It kind of goes against the sense of individuaity Miitomo’s basic clothing options seem to provide. You can’t just talk to people at will with Miitomo. You’re pretty much relegated to commenting on answers to questions and the like, but by and large you can’t actually start your own conversation with people. While it does have a notification system for pretty much all added information and updated comments, there’s no system that lets you really know if someone has replied to you or just a comment you gave a like. You sort of just have to check all the comments one by one. One of the biggest blunders is that you’re actually required to use Facebook or Twitter to add friends who aren’t in the same room as you right now. Granted, you an add a friend of a friend, but anyone specific and you need to link to the aforementioned apps. Why is there no looking up friends on your Wii U and 3DS, or your Nintendo Account? What about ID numbers? What if my friends on Facebook don’t have a Miitomo but my friends on other sources don’t have Facebook? There’s too many, and they’re too long. They prevent you from being able to cancel, and they can even continue to go in a loop if you briefly lose connection. Instead of updating information at your will, Miitomo pretty much needs a constant connection while you’re using it, no matter what you’re using it for. At the end of the day, I’m not actually sure what Miitomo even is. It’s not a social network, it’s not a game. It’s not something completely different, and it’s not even something in between. It’s sort of there. But it’s a really enjoyable sort of “there,” and it doesn’t even cost you a dime. If you have any friends who might play this game on Facebook or Twitter, hey, go for it!